This dish is a slight variation of one I've previously posted. My cooking has vastly improved over the past year as I practice more and experiment with new flavours as well as travelling to new places having a great influence over what I cook. I post most of my food pictures on Instagram first and then later update the recipes on here, all of your comments about my food really encourage me to continue posting and blogging. I love to cook, its my way of being creative and you get a tasty meal at the end, what's not to love? I may also have to try and convince one of my housemates that cooking is in fact fun as he doesn't seem over-keen on the idea and as the majority of us can cook, maybe some house cooking lessons are in order! 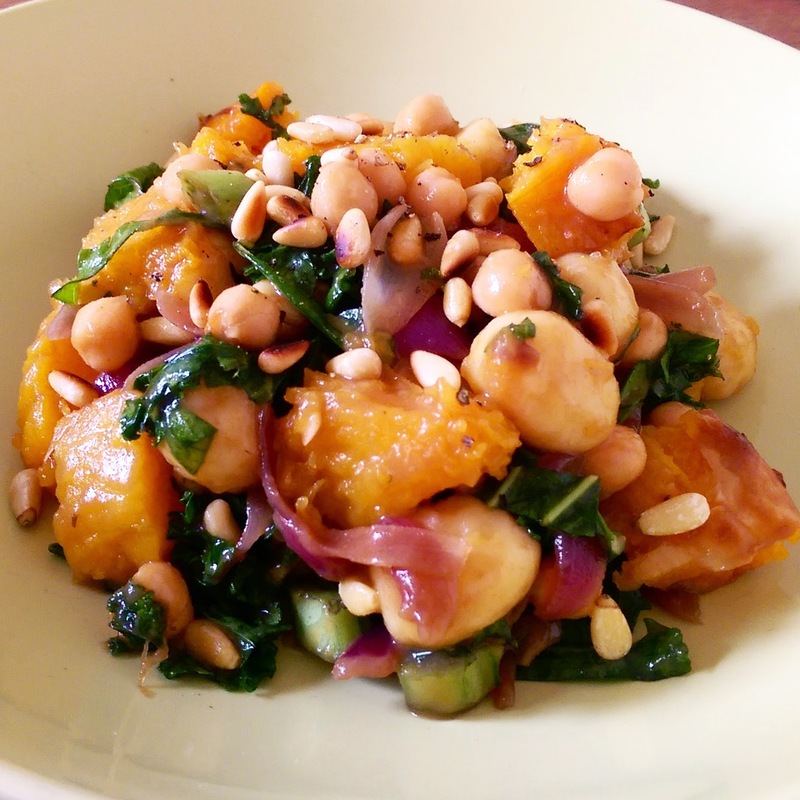 This next dish is roasted butternut squash and caramelized red onion gnocchi with kale, chickpeas and toasted pine nuts; it is the definition of comfort food but is packed with goodness! I've also had many comments about where to buy vegan gnocchi, I got mine in asda and it doesn't have any milk or eggs in like some of the other supermarkets' do which I was very pleased about. However, Asda's fruit and veg did disappoint me by not being as fresh as I would expect, unfortunately some of the produce I bought tasted off in about a day and a half, and the amount I eat of fruit and veg this is a big issue! I'm currently searching for somewhere else nearby that has a good range, and dare I say it, I actually miss the extensive range of Morrison's fruit and veg, this past year Morrison's have really stepped up their game and offer many items that other supermarkets do not, all fresh at a fantastic price too. I will post on another update when I've found a good supplier for all my fruits & veggies! Preheat the oven to 200°C. 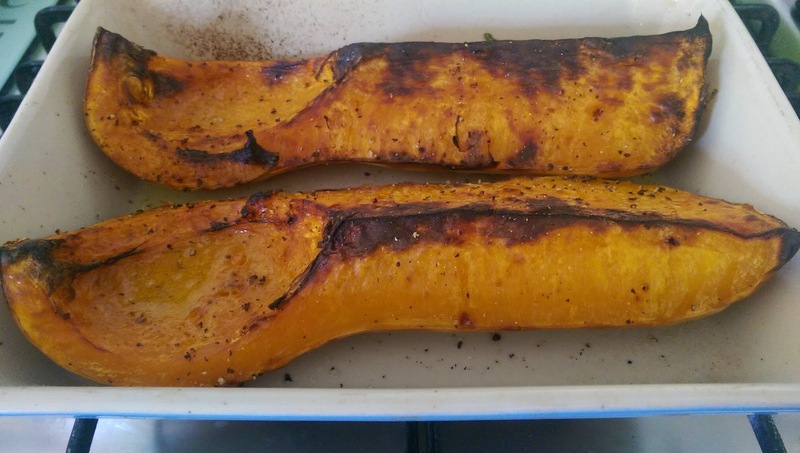 Cut the squash length-ways and place half of it in it the roasting tray, drizzle over olive oil, sprinkle with salt & pepper and place in the oven for 35-40 minutes. Meanwhile, add the red onions to a large pan or wok with a dash of olive oil, the balsamic vinegar, soy sauce and sugar and leave on a medium heat to fully reduce. Then add the gnocchi to the pan along with the stock, stir through and leave for 5 minutes on a medium-low heat. Toast the pine nuts in a dry frying pan on a medium high heat until golden brown and then add these to the gnocchi pan along with the kale and chickpeas.